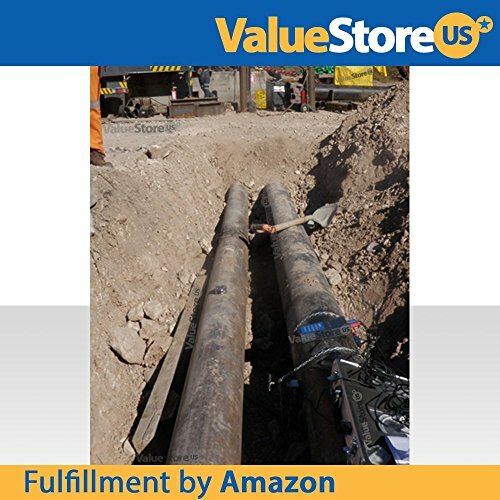 Portable Digital Ultrasonic Flow Meter USF-100 with S & M Transducers for Pipes from 0.76 to 27 inch (20 to 700 mm) & from -40°F to 320°F (-40°C to 160°C). 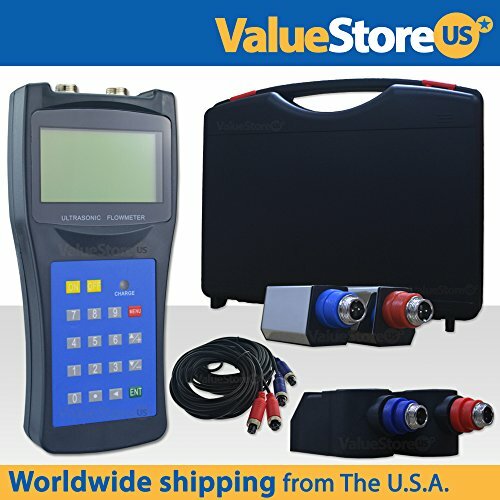 - The Handheld Ultrasonic Flow Meter USF-100 for liquids is ideal to measure a wide range of liquids like: water, sea water, kerosene, gasoline, fuel oil, crude oil, propane, butane and others. - It's perfect to measure the flow rate in pipe materials like carbon steel, stainless steel, cast iron, ductile iron, copper, PVC, aluminium, asbestos, fiber glass and others. - Calibration is easy: enter the pipe diameter, wall thickness, pipe material, liner material (if any) and the Ultrasonic Flow Meter USF-100 calculates the optimal separation (distance) for the sensors (transducers). - The transducers are non-contacting (placed on the outside of a pipe) and have not moving parts therefore the Ultrasonic Flow Meter USF-100 can not be affected by system pressure, fouling or wear. - The results can be immediately read from the display. 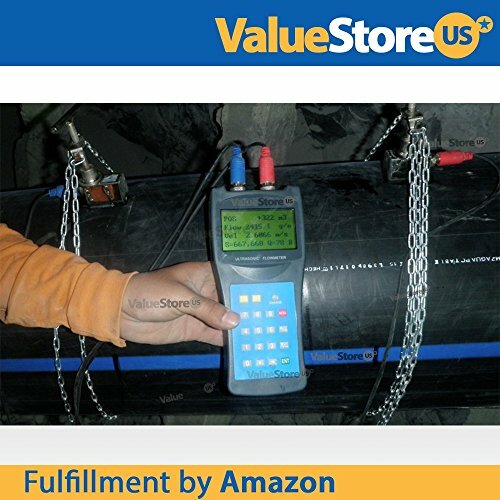 - The USF-100 can measure the flow rate in Plastic and Metallic Pipes. The High Temperature Transducers can work with temperatures from -40°F to 320°F (-40°C to 160°C). (1x) Portable Ultrasonic Flow Meter USF-100. (1x) Pair of small transducers for pipe size from 0.76 to 3.9 inch (20 to 100 mm) and temperatures from -40°F to 320°F (-40°C to 160°C). (1x) Pair of medium transducers for pipe size from 2 to 27 inch (50 to 700 mm) and temperatures from -40°F to 320°F (-40°C to 160°C). (2x) Belts (to mount/install transducers on the pipe). (2x) Signal cable 16.4 ft/ 5 meters (to connect the transducers). (1x) User Manual & Quick Installation Guide. Need transducers for bigger pipe size? - Large Transducers for pipe size from 11.8 to 236 inch (300 to 6000 mm). 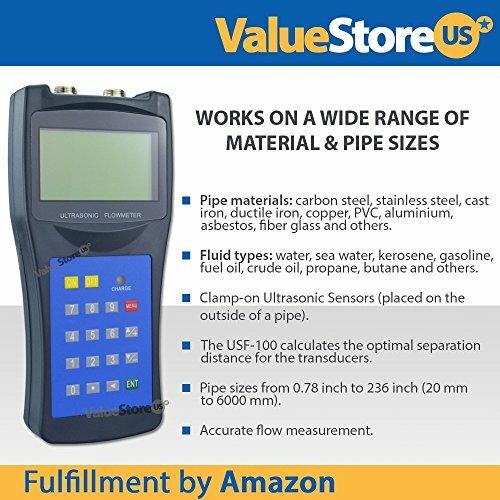 The USF-100 can measure the flow rate in Plastic and Metallic Pipes. The High Temperature Transducers can work with temperatures from -40°F to 320°F (-40°C to 160°C). Ultrasonic Flow Meter for liquids. Best measurement tool for heating systems such as Heat Pumps. The Ultrasonic Flow Meter USF-100 for liquids is ideal to measure a wide range of liquids like: water, sea water, kerosene, gasoline, fuel oil, crude oil, propane, butane and others. It's perfect to measure the flow rate in pipe materials like carbon steel, stainless steel, cast iron, ductile iron, copper, PVC, aluminium, asbestos, fiber glass and others. You only need to enter pipe characteristics and kind of liquid and the USF-100 will let you know the distance between the sensors/ transducers so that you can get an accurate reading. If you have any questions about this product by ValueStore.us, contact us by completing and submitting the form below. If you are looking for a specif part number, please include it with your message.